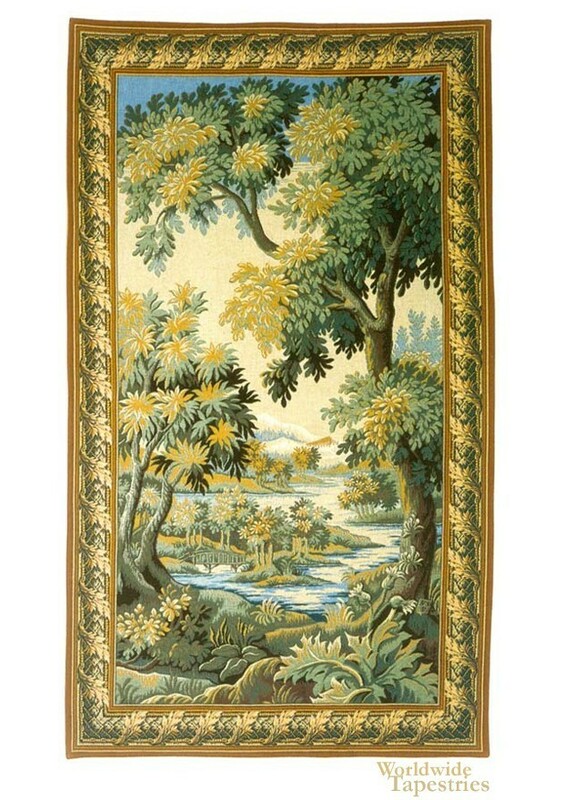 This landscape "The Forest of Clairmarais" tapestry shows a glorious scene from a 17th century French verdure original. The Clairmarais Forest was an idyllic haven which consists of oak, beech and elm trees, with a huge pond, Harchelles, measuring 7.5 acres, which were dug by monks in a nearby abbey. Here see the waterways, with land masses on either side, with an abundance of trees and forest foliage, in gorgeous greens, olives and blue greens. The scene is true to French verdure tapestry style, as we see the leaves and foliage rendered with its distinct stylized method, and with meticulous attention to design detail and composition. The large trees in the foregound meadow, overlooking the distant lake and forest, creates a sense of scale to this work. An ornate border with acanthus leaves wrapping around, accompanies this glorious landscape scene. This large French landscape tapestry "The Forest of Clairmarais" is backed with a lining and has a rod pocket for easy hanging. Note: tapestry rod, tassels, and accessories, are not included in the price. Dimensions: W 74" x H 122"